Moving to Canada? 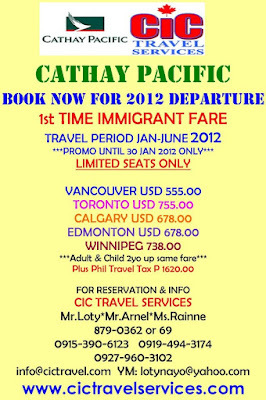 Book Now for 2012 Departure | First Time Immigrant Fare - Gateway to Canada | Canada Immigration Consultancy! Moving to Canada? Get a discounted rate from CIC Travel. Book now for 2012 Departure via Cathay Pacific. This is a special offer to all Canadian Immigration Consultancy clients!